In 2003/2004 there were 67 fatalities and almost 4,000 major injuries due to a fall from height.The following year, in April 2005, the Work at Height Regulations (WAHR) were implemented with the aim of reducing these figures. According to the Health and Safety Executive, however, falls from height still remain the most common cause of workplace fatality. In 2008/09 there were 35 fatalities, 4,654 major injuries and a further 7,065 injuries that caused the injured person to be off work for three days or more. So, although WAHR has helped to lower fatalities, the statistics are still worryingly high. Looking at it simplistically, the requirements of WAHR are relatively straightforward. Employers, or those responsible for staff or contractors working at height, need to ensure all such work is properly planned and that those carrying out the work are competent. In addition, all risks have to be assessed, and appropriate work equipment selected, used, inspected and maintained. It all sounds like perfect common sense, but in reality the complexities of the industry, from the number of different work at height scenarios to the plethora of different solutions, are such that it is a huge task to ensure the regulations are adhered to. From these points alone, the potential for confusion is easy to see. How, for example, would you categorise a sales assistant working on a ladder? An office worker sitting on a chair? Or even a mounted police officer on patrol? 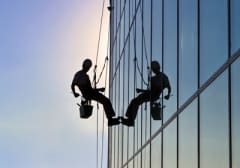 Although these examples may seem fairly mundane, the sales assistant is actually classed as working at height on the basis that he or she is moving around while working. Looking at things from this level may seem unnecessarily pedantic, but then the nature of the regulations is such that every potential scenario had to be considered in order to provide a set of guidelines that bring together all existing legal requirements related to safe work at height into a cohesive, single set of regulations, which are flexible enough to apply to all industries, but still allow for technical innovation to take place. One of the key elements of the WAHR is the hierarchy of rules relating to the management and selection of equipment for work at height, the first rule being don’t work at height unless you have to. Put simply, if there is an alternative means of carrying out the work, which avoids working at height, then do it that way. Failing that, the advice is to look for an ‘existing place of work’ from which to carry out the job, e.g. somewhere you don’t need to use or add additional equipment to guard against falling. Finally, where working at height can’t be avoided or an existing work place located, then equipment or a method of work that prevents, or at least reduces the consequences of a fall needs to be found. These rules also demand that the equipment and methods selected must take into account the risks associated with installation, use, dismantling and rescue procedures. The importance of this risk assessment can’t be underestimated, as it dictates virtually every aspect of working at height. Various options can either be ruled in or out purely by the risk involved and, if carried out properly, the most suitable solution found. Other factors that need to taken into account include weather conditions, the fragility of the surface being worked upon and the potential for injury caused by falling objects. The number of different variables that need to be considered in order to adhere to WAHR is staggering. Add to that the variety of different solutions, from rope access to cradle systems, fall protection nets and guardrails to travelling gantries and mansafe posts, and the difficulty of the task facing a layman seeking to work successfully within the regulations is easy to see. And that’s before you take into account the training of operatives, and the inspection and maintenance of installed systems. With access to roofs and other high level structures required in all sectors of industry on a daily basis, whether it is gutter cleaning or access to rooftop plant for maintenance and repairs, it is essential that adequate systems are in place to protect workers against falls. I thought it would be useful, therefore, to outline some of the solutions available and the minimum requirements needed when people are working on roofs or on the side of buildings. Fall protection systems can be divided into two main categories: collective fall protection and personal fall protection. Collective fall protection, as the name suggests, is designed to make roofs totally safe for anyone venturing onto them, thereby completely removing the risk of a fall from the building. There are a number of solutions available. For example, guardrail systems can be used to safeguard unprotected edges, cordon off fragile materials such as roof lights, or designate emergency escape routes. Guardrail systems can be either freestanding or fixed, although the freestanding guardrails are permanently installed and fully tested, with the system designed around proven counterweight principles. These are suitable for installation to controlled roofs and other areas requiring periodic access, with the prefabricated components providing maximum versatility on site, enabling sections to be taken down, added to and re-erected. The guardrails can be installed on a wide range of flat roofs and even up to a ten degree pitch, regardless of shape, dimension or level. Fixed guardrails, on the other hand, are a permanent collective solution for roofs of any pitch or areas where access is unrestricted, such as open roofs, terraces and ramps. It is not just a case of ensuring people don’t fall off the roof, however; equal attention must also be paid to prevent people falling through the roof. There are a number of solutions available, such as a permanent non-slip safe walking surface that protects fragile roofs from potential damage where site operatives must tread, or in areas of heavy foot traffic. These walkways can be fitted to a variety of roofing systems and installed with or without handrails. To provide maximum fall protection they can also be combined with a horizontal lifeline. The walkway systems provide an even walking surface across all roof types including corrugated metal and asbestos sheeting. Manufactured from PVC-U or aluminium extrusions, the systems incorporate a top plank that has a safety tread to create an anti-slip surface, which is vital – especially in wet conditions. On older buildings where the roof is particularly fragile, created by the presence of glazing, polycarbonate roof lights or asbestos cement roof sheets, for example, it may be necessary to fit PVC-U fall proof covers. Using the same material as the walkway system, the fall proof covers incorporate a red extrusion on either side to clearly demarcate the edge of the safe boundary. Naturally, where roofs have different levels, it’s necessary to install the appropriate method of traversing to ensure safe passage. Depending on the requirement, the options include stairs for routine access, or as a fire escape; vertical fixed ladders, which are most commonly used on the outside of structures or between roof levels on larger buildings; or ‘ship ladders’, which have a pitch of 65 – 75 degrees and are more practical to use than vertical ladders if the application permits. Although guidelines state that collective systems must be given priority over personal protection systems wherever possible, there are instances where this is not possible due to design restraints or planning restrictions. In these cases there are a variety of personal protection systems available. When specifying lifeline systems, however, fall restraint should always be given priority over fall arrest systems. In other words it is better to stop someone falling from the roof than enabling the operative to physically fall so that the fall is arrested, and they have to be rescued. There are a number of options available for personal protection systems. These can be separated into two different groups, the first being a range of anchors, cable systems, rail systems and counterweight anchors. The anchors can be used on thin metal roof sheets and other roofing substrates as structural anchors and, by using force management technology they are able to limit the forces in the system that are?generated in the event of a fall to less than 10kN (2200lbs) through a built in energy absorber. The reaction of the anchor reorientates the load to a more beneficial plane for the roof structure and distributes load through the fixings to ensure the integrity of the roof system is maintained, even in a multi-user scenario. Individual anchors are fitted to provide individual fall restraint. When used in conjunction with a cable system, however, which is attached to each anchor point, multiple workers can then clip onto the cable. The cable can span up to 12m (40ft) between anchors, allowing the operative freedom to move along large sections of the roof and provide them with continuous hands free access. For those looking for total freedom to move across the roof and to even navigate corners and changes of direction in the building or structure, the rail system is the one to choose. Manufactured from extruded aluminium, it is ideal for modern building projects, for roof access in particular, and as an anchor point for suspended work positioning for external façade access, inspection and maintenance. The roof mounted rail meets the requirements of both abseil and fall protection standards and can be fixed to the roof system with minor penetrations, or by using clamps. It provides excellent functionality through its free flowing attachment carriage and, with no brackets to pass over, the user enjoys a truly hands free experience. Where roofs are pitched at more than 15 degrees, it provides a sound anchorage that will not flex when a worker applies their body weight to it. This provides a good sense of security and allows them to work with confidence. In the event of a fall the product does not deflect and distributes very low loads to the roof structure. In the event that roof penetrations are not desirable on larger roof areas, counterweight anchor systems can be used as they offer both fall arrest and work restraint capabilities via a series of weights joined to a single plate and anchorage point. The anchors are designed to be placed on an approved roofing surface and, in the event of a fall, use their counterweight to arrest a worker. The anchors can be used by a single worker and as part of a more comprehensive safety system. When fixing to the roofing sheet is not an option, the alternative is to choose from a range of horizontal fall protection systems. As the name suggests, this is when the operative is working at height on flat surfaces. The systems fix to structures including walls, soffits, steelwork and through roofs into the main structure and can be either 8mm steel wire based, 16mm rope based or rail based. When the situation permits, such as working on a flat roof or walking along a platform on the side of the building, the operative can be anchored to the building. A horizontal fall protection system is available which can span up to 12m (40ft) between support brackets, with a free flowing bypass capability that can navigate corners and contours in building designs. When there is not a building to attach the support to, however, it is necessary to consider an overhead lifeline system which offers both fall arrest and restraint capabilities, using a 1 x 19 8mm stainless steel cable secured to a structure using a range of anchorage fittings. One overhead system consists of a horizontally mounted lifeline supported at regular intervals by intermediate brackets, which help to reduce the loads in the event of a fall, limit cable deflections and allow for longer single installations. The two wheeled attachment carriages are secured to the system during installation and, when in use, move over the intermediate brackets without interruption. This is a hands free system with a minimum breaking strength of 38kN (8400lbs). It can span up to 30 metres (100ft) between intermediate supports due to the high pre-tension loading and the properties of the cable. In the event of a fall there is an alternative to arresting the fall followed by the operative then being retracted either by themselves or a colleague. A controlled rate descent device gently lowers the worker automatically to the ground at a rate of 0.5m per second. This significantly reduces the risk of injury, as the device does not lock if the worker falls, which can subject them to dynamic arrest forces and potential injury from suspension trauma. It also takes away concern for the worker being rescued in the event of a fall. It is a sobering thought to know that the average life expectancy of a suspended casualty is just 17 minutes from the time of a fall. This demonstrates the importance of not just having the fall protection and fall arrest systems in place, but also the need for a rescue kit and a fully trained operative. It is important to note that on all buildings or structures that require operatives to work at height a suitable risk assessment must be produced before anyone can actually proceed with the work. For most fall protection systems this requires an adequate rescue plan to be in place at all times while operatives are working at height. While this article just covers aspects of fall protection systems, the range of products protecting those working at height is vast. For example, I have not touched upon the façade access systems, which range from rope access through to huge building maintenance units that provide hoisting heights of 400m and jib outreach up to 35m, enabling access to even the tallest and most complex building façades. Hopefully I have communicated the message that protecting those working at height is a complex business with a wide variety of alternatives. It is therefore imperative that you discuss your requirements with specialist companies who can advise you about the right system for your building. John Hepworth is the sales and marketing director of roof safety and façade access solutions for Rostek-UK. With the backing of the international group combined with decades of experience brought together within Rostek-UK, the company has already staked its claim as one of the country’s leading fall protection and façade access specialists. In the first 12 months alone, the Sheffield-based company secured and completed a host of major projects across its key disciplines including hospitals, sports centres, visitor attractions and huge residential and office buildings. This success was achieved thanks to a flexible approach that is aimed at delivering solutions that enable operatives to work safely at height, no matter what the scenario. Such flexibility is possible thanks to a team comprising a host of highly experienced industry experts, including specialist designers, project managers, installation engineers and trainers, and the support of global working at height specialist, Rostek Oy. Operating across four divisions – consultancy, façade access, fall protection, and testing and maintenance – Rostek-UK works UK-wide with developers, architects, engineers, contractors, landlords, Health and Safety personnel, property agents and facility managers.